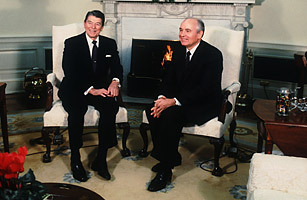 In his first visit to the U.S., Soviet General Secretary Mikhail Gorbachev arrived in Washington in December 1987 to sign the Intermediate-Range Nuclear Forces Treaty, which, as President Ronald Reagan described at the time, would bring about "the complete elimination of an entire class of U.S. and Soviet missiles." The three-day summit  and the state dinner that was held the evening of the signing  came six months after Reagan's famous speech at the Brandenburg Gate in Berlin urging Gorbachev to "tear down this wall!" At the dinner, the Gorbachevs merrily sang along to "Moscow Nights," played by renowned pianist Van Cliburn, which prompted the President, a former actor, to respond to the Soviet leader by saying, "Maybe we can get some bookings." Read "Reagan and Gorbachev: The Odd Couple."